Where are the world’s most gifted programmers? 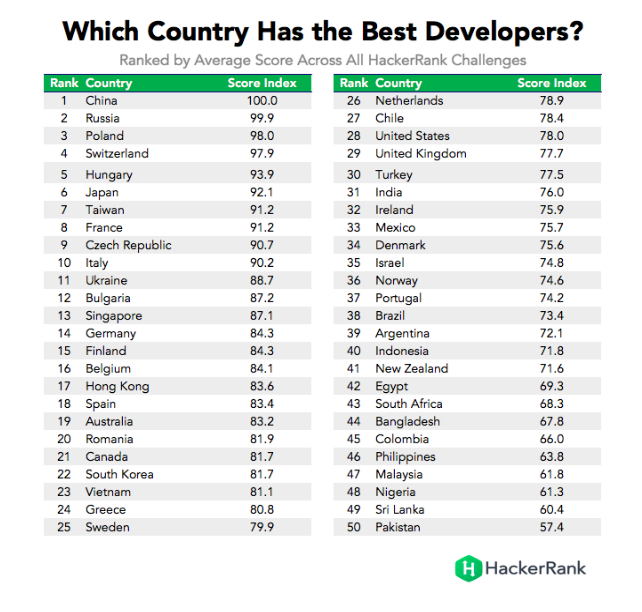 You might guess China or Russia, and you wouldn’t be wrong: developers in those countries rank 1st and 2nd, respectively, in a new report released by popular coding website HackerRank. But would you guess that Czech programmers rank among the top 10 globally? HackerRank works by giving prospective coders “challenges” to solve and rating them according to their abilities. Tens of thousands of new challenges in a variety of coding languages are regularly posted, and programmers are ranked according to speed and accuracy in solving them. With nearly 1.5 million developers ranked across the world, HackerRank has compiled the data by location and released global rankings by country. Czech coders even ranked at the top in one challenge. What about programmers in the USA and UK? They rate 29th and 30th, respectively.